Think of this as a who dunnit or perhaps who didn’t do it. There are five members of the household. Four of them have what I’ll term “sweet teeth”. Two need to reduce their weight. Two are in tip-top shape and burn calories faster than a hummer burns petrol. One has a guest over for dinner and one does not like cornbread. This tale was inspired by my friend, the author and award-winning chef, Jane Ward. Along with her latest Huffington Post accolades, Jane recently posted a lovely rhubarb upside down cake recipe. Oh yes, rhubarb is a taste of summer but unfortunately, not the taste of a summer in the desert. 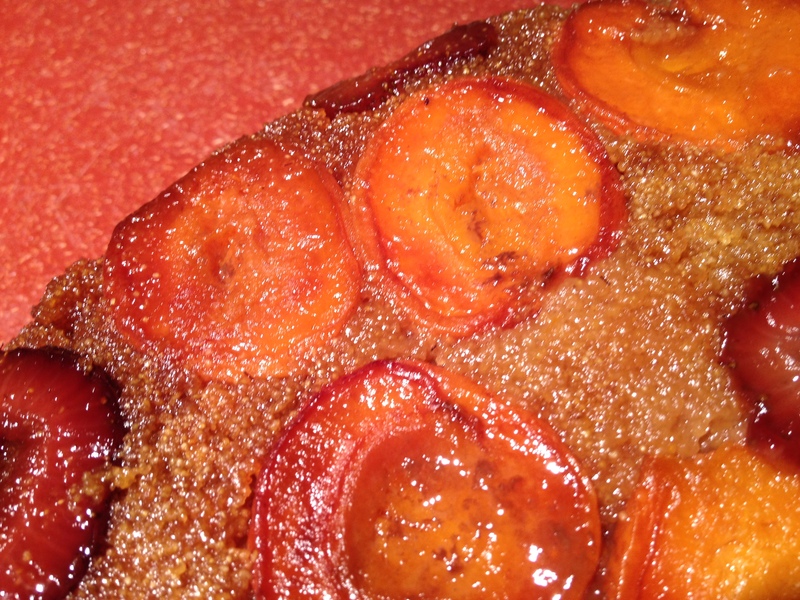 Without any on hand, I defaulted to my apricot upside down cake. Together with a few organic strawberries, I baked a cake late at night after dinner. This is not a common occurrence in our home. I don’t often bake and I rarely make dessert. But I love this recipe for a few reasons; it is very easy, the semolina creates a rich but not overly sweet bite and last, the whole thing comes together in my cast iron skillet, which you recognize as one of my favorite cooking tools. As I flipped the pan over to reveal this dense goodness, I couldn’t resist. I withdrew a small slice to conduct my motherly duty of poison tester. Then I headed out to take orders. I received two and delivered two warm moist slices. Two? It was late. I cleaned the kitchen and ran off to pack for a business trip. Last night, I returned to find nearly half the cake still here. Is it not delicious? “You know I don’t like cornbread,” scoffed the youngest. “Heavy cream, sugar and butter? What’s not to love? The scales in the morning,” warned my darling husband. “That’s a lot of fat, isn’t it?.” asked the oldest son strolling by as though he’s trying out for an Abercrombie ad. As I’m writing this, my middle son comes into the kitchen and plates up a large slice. He slathers it with whipped cream and says, “it’s great cake mom.” He’s right. It is great cake but it appears that our family appetites are changing. Yesterday was his birthday and since I was traveling, we’re celebrating today. “What are your cake needs,” I ask. He offers a broad devilish thirteen year old grin ands says, “chocolate.” Ah, normalcy in the midst of change. I suppose in three years it will be different when he also takes on the slow shirtless walk through the house practicing to woo women. And I will accommodate then just as I try to do now. Happy Birthday Calvin. Have any of you found that your tastes and your family eating habits have changed? What are you consuming less of? More of? Is it driven by health circumstances or simply changing taste buds? Do you forego those old foods all together or still stir them up on special occasions? This looks wonderful! I just picked my first big strawberries of the season this morning. I’m wanting less chocolate, more fruit when I crave sweets. Thanks for a mouth watering post! Sweet recipes are always the most popular posts. By the way, I just got notification that you were my 1,000th “like”. Thanks! I feel like I need to celebrate that. Just finished those chocolate cupcakes for the birthday and they look really good. Maybe that way? My mouth is watering staring at those moist yummy cake pictures!! We are at a stage of ALL sweets, ALL food in our fridge is consumed as fast as I can put it in there. My boys are only 2.5 and almost 5 but I swear they eat like they are teens burning calories as fast as they can. What a beautiful lush looking cake! I find I’m changing…so I’m finding it rather hard to cook, or to even buy groceries. Happy Birthday to your son…he is at the right age for girls and to burn lots of calories! Yes, I keep trying to keep him young but alas, girls are just around the corner. Wow Tammy – that cake would be gone in a flash around here! I am a total sucker for a good upside down cake. I’m really picky now about the off flavors of processed foods. I don’t enjoy them anymore – either they feel chemical-y, strangely greasy or odd in texture to me. 4 of us no longer eat salad dressing. It’s odd. I make a salad almost every night and we eat it plain. I believe that stirring up a little sweet dessert on occasion is good for us! It’s the excess and mindlessness that gets us in trouble. As for changing, yes! Everyone I’m eating with is eating more and more with health in mind. Even the youngsters! It’s exhilarating to be part of the change and witness to the benefits of healthy, whole food. Beautiful photo (and cake! ), Tammy! It’s fun when the whole family embraces it. That is a gorgeous creature. Chocolate was here last night in great form. Post to come. *blushing* thanks for the nod. I. like you, love the texture and the not-too-sweet sweetness of semolina cakes. Yes, texture is a big part of it. wow…this looks SOOOOO good 🙂 You had me at apricots + strawberries + cake…SOLD! It looks so moist and fruity and yummy! I giggled at youngest and oldest and hubby comments. Wow! We tend to love sweets, but I have stopped baking as many. Maybe my slowing down in the kitchen will help us health wise too! My preferences do change with the seasons, Tammy. I’m almost vegan in the the summer and vegetarian in the winter. Throughout, I enjoy raw as much as possible except when the weather is nasty at which time a good stew or soup is called for. The cake looks yummy to this sweet tooth! I want to move more towards raw but I find it really challenging. It’s highly labour intensive and does require some special kitchen gadgets. Thankfully, since 100% raw is not the answer either, I’m content to be as raw as I can and want to be. Yes, who made it? Can I have some? Heavenly bliss with a delicious sweetness that is hard to forget. 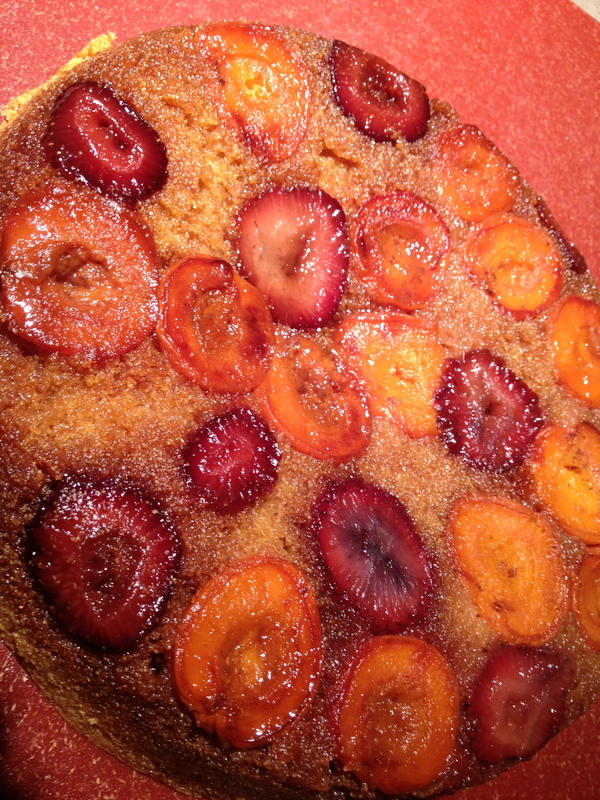 I love pineapple upside down cake but never have I tried an apricot strawberry version. Time to browse the cake shop in town or better yet, beg my wife to cook one for me. Thanks. Maybe you can cook one for her? I’ve noticed my relationship to salt and sugar change a lot over the last few years. Trying to get better about tasting a dish before I serve to get the seasoning just right has meant we hardly ever use the salt and pepper shakers. I don’t think I even have table salt right now (I cook with sea salt or kosher salt mostly). And over the last year of CSA programs we’ve been eating out less and less and focusing more on fresh foods, so my sugar intake has gone way down. Now when I eat or drink something very sugary I feel all buzzy for the rest of the day. That said, I’m pretty sure I could eat half that cake and be fine. It looks delicious. I also cook with sea salt and taste things as I go. I remember that about you. I had to look up pavlova when you first mentioned it. That looks delicious! My mother often plays the role of “poison tester” too. I know that my friends’ appetites are changing – they’re more open to trying exotic dinners at my house as opposed to going out for chicken fingers. Our tastes have definitely changed over the years. We are eating less red meat, more fruits and veggies, less fats. I have found I don’t crave or enjoy the sweets as much as I did when I was younger. It’s OK, though, as eating fewer calories is not a bad thing. But I still crave wine! I have been very sneakily weaning my family off a good deal of their animal protein as the weather turns warmer. So far no one has noticed and/or complained. I like lightening up the plates in the summer. That’s not a bad thing as far as I’m concerned. My next move will be to get our dinner on the table earlier. We eat really late at our house. wonderful post and great looking cake. Yes, since our children have grown and flown away, my husband and I do not eat as much. I miss cooking for a large family. Both my parents and I went through dietary changes. With my dad and me, it’s mostly health-related (my dad doesn’t tolerate gluten anymore after a bowel infection a couple of years ago, but we didn’t find that out until last summer). My mom wanted to get off the sweets anyway, so she tries to eat very little sugar and more vegetables and protein. Both sound like very wise decisions. Definitely from scratch and good wholesome ingredients. Fruit always make dessert seem more wholesome to me! It is just delicious Tandy! Tammy, I just learned that Jamie from Musing by Moonlight blog is going on the Engine 2 diet – 28 day challenge. Jamie is very open about having Celiac Disease so she’s very cautious about eating. She pointed me to Whole Foods site: http://www.wholefoodsmarket.com/healthstartshere/ . Look at the left side to see the 28 day challenge. The menus and the recipes look very manageable – plant-based or not. Some of it can be raw. I thought you may be interested in some of the recipes and food plans. I will check it out Amy. Thanks. I’ve always thought coooking for a family must be the hardest thing to do – to try and keep everyone reasonably happy. It sounds like you walk the wire well! I remember not liking tomatoes – the smell was too strong for me as a child, that was soon sorted, oh and the classic olives, loved them when I reached my twenties! The upside down cake looks divine ! I have a hard time with a strict vegetarian, me – sort of a veg, and the meat eaters. So, now that they’re dissing the sweets too, oh yes, it’s challenging. What a fantasticly looking upside down cake! I love the flavours ! Apricot & strawberry is a very tasty combo! A great & lovely post, Tammy! Wow! 6kg each? That’s fantastic. That’s where I need to be also. Because I think your blog rocks, I nominated you for two awards….come check out my post to see what you’ve won (just don’t expect any cash or prizes…I can only afford gold stars and high fives)! http://inherchucks.com/2012/06/13/feelin-the-love/. yummy this looks so delish. love your blog! I would slurrp this cake at any instant. Fabulous. And such a fun post…hahahaha, what’s not to love? The scales. Hahahahahahaha…..I am loving your family. The scene here is pretty similar- Rohan seems to change his food habits once in a century although he now eats some veggies and potatoes. I’m tired of cooking the same thing over and over again. This cake looks amazing! I would devour it for sure! I can also definitely relate to changing food tastes. In the past year or so my body decided it didn’t really have the Head-Over-Heels-In-Love relationship with animal products that I have been nurturing my entire life, and now I eat very little meat or dairy (basically just goat cheese) at all. When I was a child I had an aunt who did catering, she had Green peppers in everything, which I didn’t like, but today I love them. I ended up tossing the rest of that lovely cake but that’s okay. It’s just a sign of growth. Thanks for the shout out?